What Is the Design-Build Process—And What Does It Mean for Remodeling Your Chicago North Shore Home? 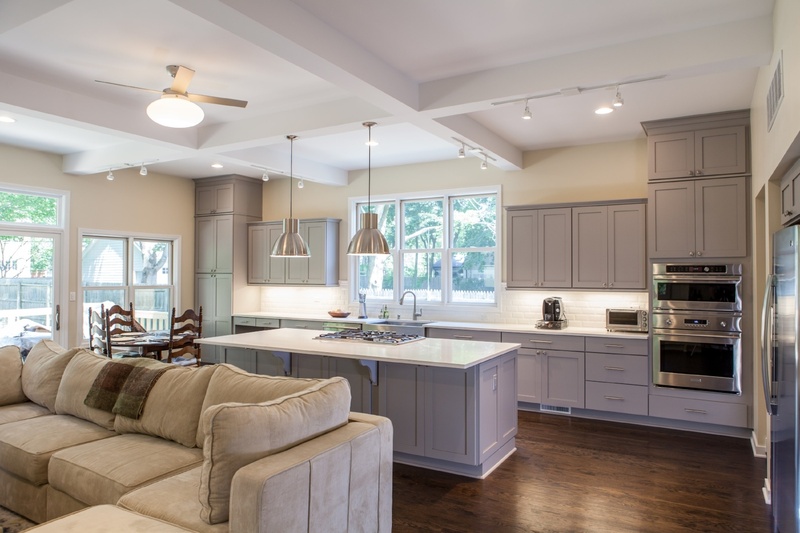 When you decide it’s time to remodel your Chicago North Shore home, you can choose a conventional remodeling service or you can opt for a design/build remodeling approach. 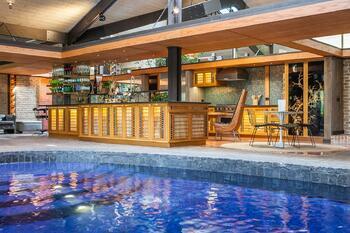 What makes design/build remodeling different? What Makes Design-Build Remodeling Different? 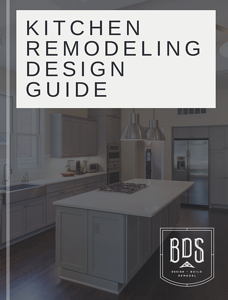 There are a number of things that separate the way design-build remodelers approach a project from the way that general contractors do. Let’s look at five of those things—and how they benefit you as a homeowner. Design and Communication: Great remodeling results begin with great design. When you work with a design-build remodeler, members of the same team are working on both parts of the remodeling equation. Your designer won’t create a plan that the craftsmen can’t build. Even if you run into tricky situations, a design-builder team works together to make sure the solution is aesthetically pleasing—and functional. Faster Completion: You’ve heard about delays some homeowners experience when remodeling. Because of the superior communication between team members mentioned above, there’s no time lost due to miscommunication. There’s no waiting for someone to get back to the contractor to clarify. Everything is handled as a team effort. Superior Quality: Every aspect of the design and construction is closely monitored at every stage of the process. Once again, because everyone involved in the renovation is on the same team there is no debate or variance about what constitutes a quality result. You get consistency from start to finish. General contractors will often specify the least expensive materials for your project (commonly referred to as “builder quality” materials). That’s not the way we operate at BDS. After finding out what you want, we specify and acquire the materials that will deliver the quality, look, and comfort you want when the project is complete—and for many years to come. No Getting Caught in the Middle: It’s unfortunate, but sometimes remodeling projects can devolve into finger-pointing and assigning blame. That won’t happen with a design-build remodeler. There’s no room for finger pointing. Everyone on the team shares responsibility—and is motivated to get it right the first time. As the homeowner, you have the ultimate say. A design-build remodeler depends entirely on your satisfaction for his or her reputation. Responsibility can’t be shifted to anyone else. Here’s a look at why a great relationship is so essential for homeowners and remodelers. Clear and Consistent Pricing: Having the designers and the builders working in concert from the very beginning results in better planning and processes. That eliminates costly “surprises” in the remodeling process. The result is that you can be assured that the price you’re quoted is the price you’ll pay. In a way, the design-build process is a bit like “one-stop shopping” for your remodeling needs. You have everything you need in one place. 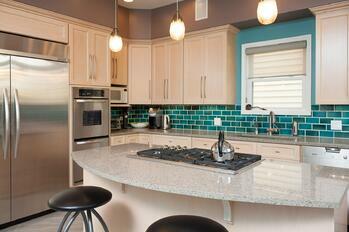 Of course, choosing the right remodeling company (one you can trust) is essential to getting the right results. 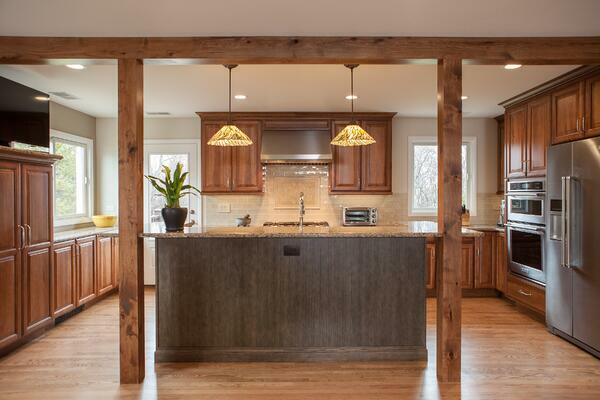 As a design-build remodeler, we generally break the process down into three important phases. Here’s a quick overview of what happens in each phase. Pre-Construction Commitment: Of course the process doesn’t end with listening. To get superior results requires a comprehensive plan of action to ensure the project is completed successfully and stays on budget. It requires a thorough knowledge of design—as well as the ability to formulate a plan for creating the design. 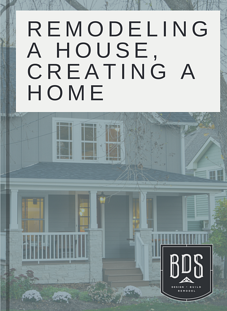 The experts at BDS are well versed in all phases of project planning, and they know exactly which steps needed to guarantee that every detail is covered. During this phase, we work with you systematically to determine the exact quality levels of materials needed to deliver the results you want and we create the plan for building. We work with you to finalize the selection of interior and/or exterior finishes. We then walk you through the entire project with our construction team. When all decisions are made we can accurately finalize the costs, schedule, and contract. This eliminates the surprises (for both cost and schedule) that so many homeowners dread. Seamless Construction: In this part of the process, you’ll be introduced to your Project manager and you’ll do an entire project review on site. It’s an opportunity for you to ask any questions about the process. Once construction commences, you’ll receive regular updates on the process as well as communication about any questions you may have. We will stay in contact with you after the completion of your project to ensure you’re enjoying your completed update. It’s one thing to talk about the concept of design-build remodeling. It’s another thing to see actual examples of how the process works. Here are a few examples of projects we’ve successfully completed using the design-build process. It’s been said that the kitchen is the heart of the home. It’s arguably the most used room in the house. Meal preparation, casual meals, family meetings, and entertaining all happen here. That’s why it’s so essential to plan your kitchen properly to meet all of those needs—and to give you a look you’ll love. Click here for additional photos that will show you how we created a kitchen that does all that for one Chicago North Shore family. Bathrooms today are much more than purely functional “necessary rooms.” They are private spaces that comfort and pamper you and make getting ready for your day—or winding down for the night—a convenient pleasure. 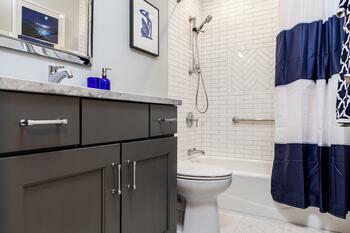 Click here for photos of the Master Bathroom we created with a Kenilworth homeowner. If you grew up in the Chicago area basements may evoke memories of dark, dank caverns where guys would sometimes retreat to watch the Bears, the Bulls, or the Blackhawks. Today’s remodeled basements are brighter, more beautiful and can be great spots to watch sports, movies, or simply listen to music with friends. 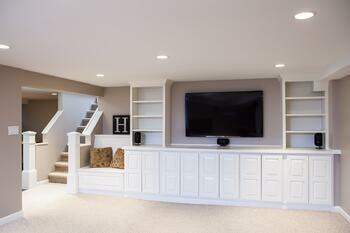 Click here for images of what this Libertyville homeowner created in the basement. Sometimes there’s just no substitute for more space. Maybe you need an extra bedroom because your kids are too old to share. Perhaps you want to build an “in-law suite” for aging parents. Or it could be that you want a special room in which to entertain your friends like the owners of this Barrington home did. Click here for additional pictures. What can you do if you love your neighborhood and really like the general exterior of your home—but find that the interior no longer meets your needs or reflects your personal sense of style? That’s when a whole home remodeling may be in order. It’s essential, however, that you work with a designer and builder who will make sure all the parts work together to create the look and flow you want in your new/old home. 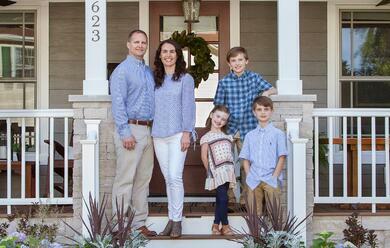 Click here for photos of how these homeowners in Libertyville were able to do that. Educating yourself about the process and the possibilities is essential in order to get the best results. We’re committed to helping our clients get the information they need in order to come up with the best ideas and make the right choices for their home. That’s why we offer free remodeling resources that help them inform themselves. 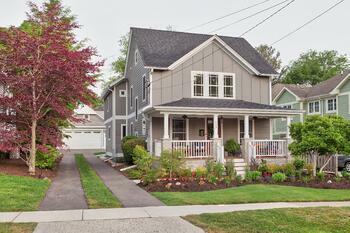 Some people are content to simply give their homes a bit of a "facelift." They just want to freshen things up a bit. However, if you want your Chicago North Shore home to better fit your family's needs—and to truly reflect your sense of style and comfort, you may want more. Design-build provides a design that is created to meet those demands. It eliminates much of the stress and uncertainty of remodeling because it's a seamless process where details don't fall through the cracks. It is also a process that identifies scope and cost up front—so there are no financial surprises when you get the final bill. If that appeals to you, we invite you to find out why Remodeling Magazine has named us one of their “Big 50 Remodelers.” We’d love to help you turn your North Shore home into the home of your dreams! Our goal is to make this process an enjoyable experience for you. We want you to love the enhancements to your home – and share your experience with others who would benefit from our services.